I was not prepared for what I found when I visited the al-Malalha family in Rafah, in the far south of the Gaza Strip. Their street was lightless, but the dim glow of the moon helped me see so I could walk without tripping. It was lined with farmland and greenhouses. Nothing could be heard but the sound of crickets. Then my companion pointed at the house we were going to visit. I saw nothing other than a barn seemingly constructed from tin plates that looked like it was for goats and chickens. I was shocked when he told me it was a family’s home. The yard was tiny and crowded. It’s where the family—a husband and wife and their four children—hang laundry, play and scoop water from a large barrel for drinking and washing. A dung-like smell emanated from the house and was hard to stomach. But I hid my reaction so I would not offend the residents, al-Abed, 34, and Mona, 32, who came out to greet us. I shook al-Abed’s hands and waved at Mona. Al-Abed’s face showed his weariness, with deep, vertical lines carved into his cheeks. Like most of the men in Gaza, which has the highest unemployment rate in the world, El-Abed is jobless. Mona, a housewife, has anxious, brown eyes that tell a story by themselves. The Malalha family’s home has only one bedroom for all six members, as well as a small kitchen. But there is not much they can cook due to the lack of income; they can only afford to feed their children meat—an important source of protein—twice a month. To try to improve their situation, Mona has started a small business selling biscuits and chocolates for kids. Her little booth is made of tin plates and helps them buy bread and rice, which are what they primarily eat for their daily meals. Al-Abed hurriedly brought us chairs and we sat to chat about the two solar lights (Nur al-Amal, or Light of Hope) they recently received from the Women’s Program Center in Rafah, thanks to a donation from the American NGO Rebuilding Alliance. 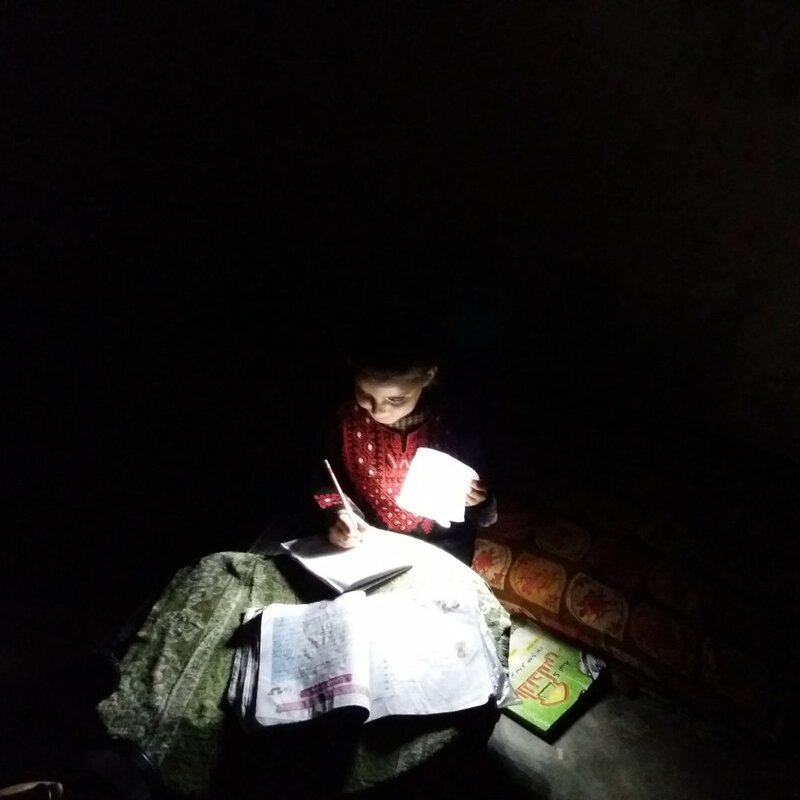 The two organizations collaborate on the It’s Time for Light campaign to relieve the hardships caused by the severe shortage of electricity in Gaza. Due to the shortage of fuel and lack of power-plant equipment imposed by the Israeli blockade, the Malhalla family gets only three hours of electricity per day. The solar lights are “a gift from Allah,” Mona said. However, the crossing into Egypt is closed most of the time and it is very difficult to obtain a permit to leave through Israel. In 2017, 54 Gaza patients died while awaiting Israeli permits. International organizations report that the number of medical permits given by Israeli authorities last year decreased to the lowest number since 2008. I asked Maram, who looked normal and happy, about how the light helped her, and she said she isn’t scared anymore when she wakes up in the pitch dark.